I love fused fabric quilting for wall hangings because I can add embellishments like embroidery and buttons and still finish in a reasonable amount of time. And this type of applique is also very quick. After a few projects, I now have a lot of scraps and don’t have to spend a lot of time fusing the webbing to a lot of fabrics. Just larger pieces need to be fused and I can begin the more fun part of cutting and ironing. My children are originally from Taiwan, and they love to hear about their Chinese zodiac animals. So, I decided to make them wall hangings of their zodiac animals. One son is a rooster. I love bright batik fabric, so his rooster is a full feathered guy, with a black button eye. I added some feather stitch embroidery here and there to make sure everything stayed in place, and we hung it above his dresser where it looks out over the room, and apparently wakes him up each morning at the crack of dawn. That boy has never slept in in his life, so that part of the rooster label fits very well. My other son is a pig. Not just any pig, but a golden fire pig, which is considered very lucky and only happens every 600 years. To be honest, we don’t know a lot more about the zodiac than we have read on Wikipedia. To add to the doubtfulness, the description of fire pigs doesn’t fit my son well and would also apply to every other child born in the same 12 months, making them all equally rare (?) and exactly the same. But he enjoys the idea that he is a rare and lucky child (along with every other kid in his grade) so we go with it. For his wall quilt, which is very small, I went crazy quilt style, on top of the gaudiest and goldest (not a word?) fabric I could find. The photos don’t really do it justice. It gleams in both threads and sequins. He loves it and it is hanging right above his bed. I need to add a little more support – all those buttons at the bottom have made it start to sag a little. The next project was perhaps a bit too ambitious. I wanted an underwater sea scene for our cabin. It got a little out of hand. I just couldn’t stop adding to it. Really, I needed an editor to rein me in, or Tim Gunn to wander by and order me to stop adding embellishments. This one has it all – fused fabric, embroidery, buttons, even crochet and knitting. (Can I just say that I LOVE that there are knitting patterns for barnacles?) It took me forever to finish because I kept wandering off to other bright and shiny projects that caught my attention. This one taught me to stick to smaller, quicker projects. My most recent wall quilt defies that size lesson, however. My sister loves koi, and her husband, in random order, and she asked me to make him a koi quilt for his birthday. More fish! How could I say no? After looking at Google images of a lot of koi photos and paintings and quilts, we came up with this quilt. I sped things up a lot by skipping hand embroidery and going with machine stitching. 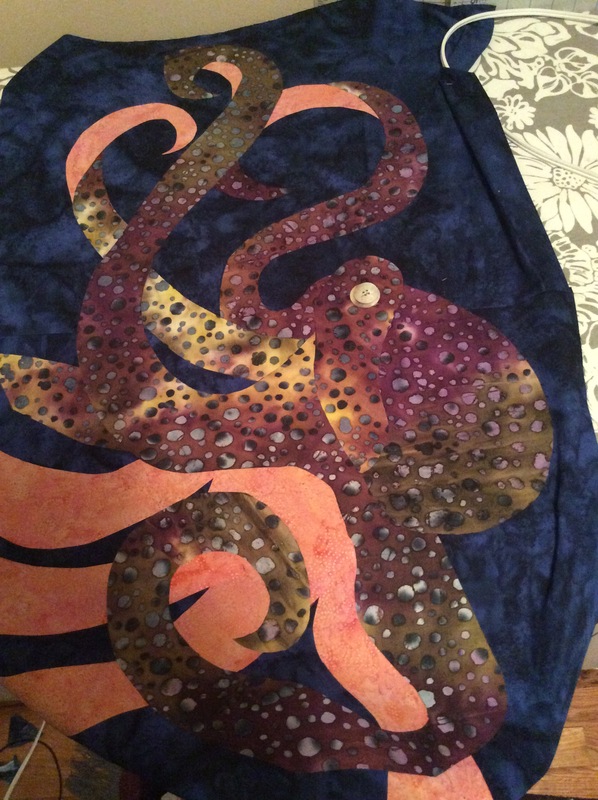 I added a lot of free motion quilting in the fins and the lily pads and to outline everything. Lots of texture without all the hours and hours of hand embroidery. He is flying in tomorrow and I’m anxious to find out if he likes his surprise. My sister seems sure it will be a hit.